If you trawl back ‘through the archives’, it is quite constructive to chart the origins of ‘the Big Society’. Often seen as the policy turkey which never flew, it was the idea that communities could produce measurable outcomes for the benefit of society through voluntary action. The “Big Society” has had more policy relaunches than either David Cameron nor the Cabinet Policy would like to remember, but many feel it has never been officially laid to rest. ‘Dementia Friends’ saw a multi-million pound initiative, involving the Alzheimer’s Society, for providing information sessions to members of the public. It is in many ways an illustration of the Big Society; and in this particular case, ‘Dementia Friends’ aims to tackle ignorance and prejudice leading to stigma and discrimination. This is indeed a worthy cause. I myself am a @DementiaFriends ‘champion’, and very proud of it. “Dementia Friendly Communities” has been a policy construct which has been very popular amongst the Big Charities globally, including the Alzheimer’s Society and Alzheimer’s Australia. Like neoliberalism, globalism by definition knows no territorial bounds; and nor does this policy apparently. David Willetts MP, often affectionately called “Two Brains” by both fans and political enemies, is known to be an intellectual power house of the Conservative Party. He is thought to have been the “brains” behind much of the private finance initiative thinking of the early 1980s in a policy document for the Social Market Foundation. The “dementia friendly communities” policy can be served up in whichever way you wish. You can argue it as a perfect vehicle to give the commercial market a slight ‘nudge’, so that ‘dementia friendly’ providers gain competitive advantage by being ‘dementia friendly’. This would benefit both customers and employers, conceivably. It makes sense of the motherhood and apple pie thinking behind providing ‘Dementia Friends’ sessions for the top FTSE100 countries, inter alia, in the current Dementia 2020 policy document (aka ‘The Prime Minister’s Dementia Vision’). At the other policy end, it is impossible to argue against inclusivity and accessibility. It is impossible for someone like me who is a card-carrying evangelist for personhood to deny that relationships underlie what it is to be a person. Such relationships, often articulated in the hyper cerebral world of ‘relational ethics’, foster solidarity and justice as suggested here. It is, however, politically interesting why the Big Society has been such a political turkey which never flew. One of the most toxic arguments against it was that it was in fact a cover for cuts. And, despite the Prime Minister’s hyperbolic claim that he wants the UK to be ‘the best place in the world to have dementia’, social care funding is on its knees. 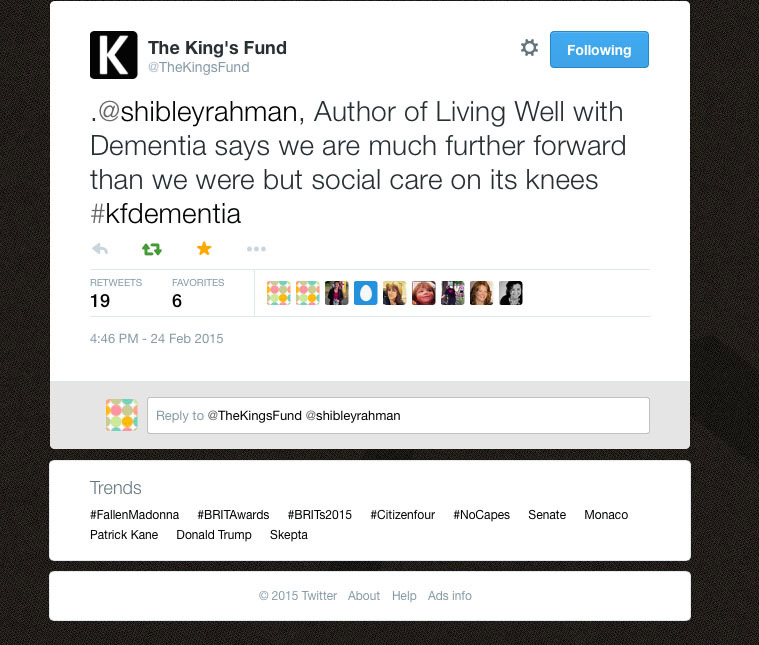 I indeed argued this as the King’s Fund when I was kindly asked to appear in their panel session. The rub is social care has not been ringfenced since 2010. It is quite impossible to consider the health and care systems to be divorced from one another, especially when you consider, for example, that cuts in social funding have been directly responsible for delayed discharges from acute hospital care into the community for NHS patients, including frail elderly people living with dementia. That’s what many of us mean by ‘breaking down silos’, for those of us with experience of acute medicine, albeit a long time ago. “Dementia Friends”, although meritorious, poses a particular problem for people like me who are prone to conspiracy theories. It is, despite its good intention, an elaborate cover for cuts. Whilst community action is undoubtedly a worthy policy construct for supporting people with all mental health issues, as indeed WISH some years argued, “Transforming lives – enhancing communities“, together with historic initiatives such as WHO ‘age-friendly cities‘, it is one approach. The other approach is to promote the autonomy, dignity and human rights of people living with dementia themselves. This approach is firmly footed in equality rights and human rights, and in a way is a form of disability activism. This is not altogether surprising, as I am physically disabled, and dementia is indeed referred to in the guidance for a qualifying condition regarding discrimination in the Equality Act (2010), legislated for by a previous government. And you will have noticed one thing about a dystopic dementia friendly community, one in which the State is rolled back. Sure, for a dementia friendly community to work, it is perfectly possible to outsource social determinants of health including housing and transport. But likewise, it can be argued that a neoliberal concept of dementia friendly communities, as may or may not be promoted by Big Charity, does not particularly care about access to high quality specialist nursing (such as Admiral nurses) or access to high street justice (such as legal aid cuts and the recently legislated Legal Aid and Sentencing and Punishment of Offenders Act 2012). But, looking on the bright side, promotion of individual rights is also very much at the heart of independent living (and de-institutionalisation which has been the scourge of mental health policy in England for many decades). In particular, I should like to commend to you @DementiaBoy, Andy Tysoe, a dementia nurse specialist at the Countess of Chester Hospital, for his important work today for @NHSChangeDay. So here’s my official NHS pledge: not to allow dementia friendly communities to be a cover for cuts, while supporting the overriding principles of inclusivity, accessibility, solidarity and justice, and “rolling back the State”, but to promote, simultaneously, legal enforceable rights of people with dementia in equality and human rights as legislated for currently in England. Previous PostHow can we tell whether #NHSChangeDay "works" for dementia?Next PostMusic – the gift horse that keeps on giving. My talk in Brighton on March 20th 2015. LOVE that Shibley! Big Charity and government cuts all round are our future here. I doubt it will change at federal elections next year. Meantime I truly wonder what the hell I’m doing with my attempts at advocacy when I can’t find someone to be with V while I’m supposed to be at a “dementia friendly community” meeting. Not kidding.